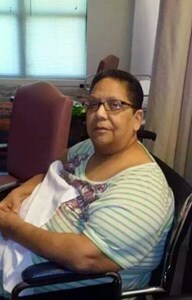 Noris Ortiz age 64, of Orlando, Florida passed away on Tuesday, January 29, 2019. Noris was born on March 13, 1954 in Manhattan, New York: daughter of Narciso Marrero and the late Eulalia Rodriguez. She was a secretary for the Head Start program in the state of New York. After moving to Orlando Florida she became a stay at home mother. She was always kind, good hearted and always willing to help someone in need. Noris’ friends and family appreciated her very much and enjoyed her sense of loyalty and dedication to helping them any chance she could. She also enjoyed going to church and being a Sunday school teacher for many years. Noris is survived by her son, Adrian Trinidad and daughter Jannette Ortiz, her sisters Sandra Camacho, Martha Rodriguez and her brothers Eddie Marrero and Hector Velazquez; her 6 nieces and nephews, Nicole M. Velez, Jonathan L. Camacho, Eulalia Velez, Nathaniel Velazquez, Juliana Rodriguez, and Alexandria Ortiz and 1 grandchild, Lawrence Lovelace Jr.
Visitation is Tuesday February 5, 2019 from 6pm to 7pm with memorial service starting at 7:30 pm at Newcomer Cremations, Funerals & Receptions (East Orlando Chapel), 895 S. Goldenrod Rd, Orlando, FL 32822. To share your memories of Noris or leave a special condolence message for her family, please click the Share Memories button above. Add your memories to the guest book of Noris Ortiz. I want to say thank you for being part of my life during the last eighteen years; it's been a privilege and an honor! As God promised in the Bible, you have a new body free from pain and suffering while continuing to enjoy life for eternity. You are truly home at last that we all look forward after completing our journeys on this earth. The video that was made looks absolutely stunning about the celebration of your life from childhood to adulthood, and you left behind two beautiful children. It's been great to know your son Adrian; he and his sister will continue their journey while still remembering you. Adrian, I know it is initially hard for you; I lost my parents also and felt briefly like an orphan. I hope you will find a nice lady that you can share your life with blessed with children (if you have a daughter, you can name her after your mother). Just take your time and live slowly; you're still young enough to get on with your life. Sandra, you get all my love and respect from me; and you're always a terrific woman and mother. Give my love to all in your family, and we'll stay in touch! Loving, caring, nurturing, gracious, and understanding are words that can only begin to describe the amazing and beautiful spirit I love about you. I will eternally miss you and all the memories we cherish, I loved making you laugh and the story's you shared. To a real earth angel enjoy those wings while you rest in peace and in glory with god. Until we meet again I know you will be watching over us. I love you titi. My dear sister.. this day I want to thank the good Lord for you and for the life you lead as a God fearing woman, but also because even though we met each other as adults already, you opened your arms and heart to me and my family as if we've known each other all our lives and that love is something I will always carry with me for the rest of my life till we see each other again in the presence of our Lord. Even though we're sad because you're gone, we also remember that "we should not be sad as others who have no hope". Now you're at peace and walking the streets of gold in heaven together with your sweet mom and all the saints. Love u sister. Thank you for your love thank you for your care all the prayer and song they will be with me even though you are gone. Love you so much. Miss you already. You will be in our hearts forever till we meet again. Noris, you will be greatly missed. I will always remember the great times we used to have with you and your family growing up. We were family. Until we meet again. Love you. Forever in our hearts. Nori, we are thankul for so many wonderful memories. Since we go way back, from Newburgh to Head Start. you touched our lives with kindness and laughter. We pray for peace to bring comfort to your love ones, courage to face the days ahead and loving memories to forever hold in your heart. our thoughts are with you. Titi loli thank you for always being a loving, strong, and supportive aunt. You prayers and spirit will always be with me and the family. Not a day will go by that I wont think of you. Miss you and love you always. Thank you God for giving us the time with your angel, may she continue to guide us from above. Te recuérdame para siempre. Fuistes como una hija para mi. Siempre nos mantuvimos en contacto y en ese amor siempre. Siento mucho tu partida. Descansa en paz mi querida Noris. Nos veremos en el cielo. Te quiero mucho. Siempre estarás en mi mente y corazón. Noris you were like an aunt to me. All my fondest childhood memories include you and your family. We were church members together, neighbors and above all we were a big happy family. You will forever be missed. Love you with all my heart. Till we meet again. Noris, we all know: you have fought the good fight, you have finished the race, you have kept the faith.Now there is in store for you the crown of righteousness. Noris is a Life Sister from childhood. We raised our children and served in the same church for years. She is an awesome Worshipper, Mom, Sister and Friend. Such wonderful memories! Thank you for being part of my life journey! Will see you again at the appointed time! Love and hugs to family and friends on Earth. Serve God with your whole heart - Noris did for sure!